Dust and opacity monitor, designed for measuring dust emission concentrations in combustion applications where automatic calibration checks are not required. The 4200+ is the most accurate and reliable monitor available for dust and opacity measurements in combustion applications not requiring automatic calibration checks and regulatory compliance. Optimised for multi-process plants using common exhaust stack sizes, 4200+ delivers you immediate performance and cost benefits through easy installation, simple operation and low maintenance requirements. A highly homogenous green LED light source, glass multi-prism retro-reflector and flood LED minimise sensitivity to changes in alignment and ambient temperature: this ensures low optical and electronic drift, giving the exceptionally accurate, stable measurement you need. Ideal for combustion applications where an automatic calibration check is not required, the 4200+ is suitable for use power generation, industrial boilers and pulp & paper industries. 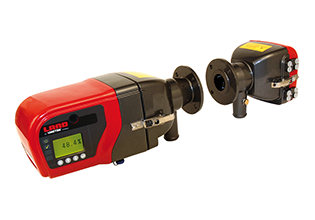 The 4200+ accurately measures dust and opacity levels across key combustion processes, including electricity generating units, industrial boilers, furnaces, kilns and dust collectors. Lightweight and compact, the 4200+ is designed to operate easily, with no moving parts to ensure high reliability. The menu tree is intuitive, using text and icon prompts. A manual calibration check can be performed while the process is running. Suitable for monitoring dust and opacity across an extensive range of combustion processes, the 4200+ operates from -40 °C to 55 °C (-40 °F to 131 °F). This brings unprecedented flexibility to a wide variety of applications. The 4200+ is AMETEK Land’s advanced, compact monitor for opacity and dust in non-compliance applications. *4500 MkIII is recommended for regulatory compliance measurements requiring automatic zero and upscale checks, as specified by ASTM D6216 and US EPA Performance Specification 1.